Ellen White (1827-1915): “As these things were presented to me so vividly, I thought, I shall never be able to present this subject before the people as it is;” and I have given you only a faint representation of what was shown me. As I have thought of that cup trembling in the hands of Christ” (9T, p. 102). Ellen White (1827-1915): “Thus it was in the betrayal, trial, and crucifixion of Jesus—all this had passed before me point by point” (Letter 14, 1889; MR 728, p. 22). Anne Catherine Emmerich (1774-1824): “I beheld every scene distinctly pourtrayed from the kiss of Judas to the last words of Jesus on the cross, and I saw in this single vision all that I see in my meditations on the Passion” (The Dolorous Passion of Our Lord Jesus Christ, p. 115, 1862 ). Ellen White (1827-1915): “She awoke with a cry of horror. Calling for pen and paper, she wrote him words of warning. Now, in Pilate’s dilemma, a messenger makes his way to him with the message from his wife, “Have thou nothing to do with that just man: for I have suffered many things this day in a dream because of him.” (Manuscript 112, 1897). Ingraham J. H (1809-1860): “What news sends my fair wife, that she should despatch you from my house in Bethany at this early hour? No evil tidings, boy”” “None, my lord – save this note.” The Greek page then handed his master a small roll of rose-tinted parchment, tied with scarlet thread” (The Prince of The House of David, p. 370, 1855). Note: All that Matthew recorded was: “When he was set down on the judgment seat, his wife sent unto him, saying, Have thou nothing to do with that just man: for I have suffered many things this day in a dream because of him”. – Matthew 27: 19. Ellen white (1827-1915): “But Jesus fainted beneath the burden. Three times they laid on Him the heavy cross, and three times he fainted” (1SG, p. 57, 1858). Ellen White: “He fell fainting beneath the burden…Again the burden was laid upon Him, and again He fell fainting to the ground” (DA, p. 742). Anne Catherine Emmerich (1774-1824): “… here he stumbled and fell for the sixth time… and no sooner did he reach Calvary than he sank down again for the seventh time” (The Dolorous Passion of Our Lord Jesus Christ, p. 246, 1862 ). 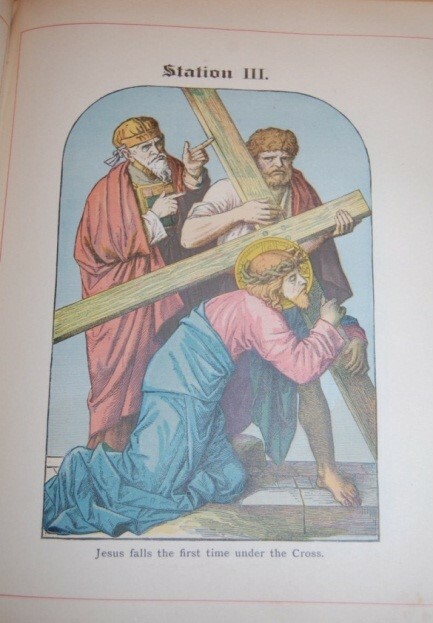 Catholic Tradition: The belief that Jesus fainted three times under the cross comes from a Catholic Tradition depicted in the ‘The 14 Stations of the Cross’, which dates back to 4th century. At the end of 17th century, the erection of Stations became more popular. In 1731, Pope Clement XII permitted stations to be erected in all churches and fixed the number at 14. Out of the 14 traditional Stations of the Cross, only 8 have clear Scriptural foundation. Stations 3, 7 and 9 which depicts Jesus fainting under the cross and stations 4, 6 and 13 are not specifically attested to in the Gospels. To provide a version of the devotions more closely aligned with the biblical accounts, Pope John Paul II introduced a form of devotions, called the Scriptural Way of the Cross on Good Friday 1991. The present 14 Stations do not include the three falls of Jesus as they are not supported by the Gospels (Stations of the Cross, Wikipedia). Note: The Pope had made changes to the long held tradition to conform to the Scriptures. You can see the differences between the Traditional and the Scriptural Stations of the cross in the lists below. Sadly though, the Adventists, who call themselves “the people of the Book,” continue to hold on to the traditional belief of the three fallings of Christ! Ellen White (1827-1915): “The Saviour was now, after being betrayed by a kiss from one of his own disciples, dragged from place to place by the murderous mob that surrounded him. He was finally taken to the judgment hall” (Advent Review and Sabbath Herald, October 9, 1888). Ellen White: “Faint and weary after his long, agonizing struggle in the garden of Gethsemane, he was dragged from one tribunal to another” (Advent Review and Sabbath Herald, September 1, 1891). William Hanna (1808-1882): “…he will let those earthly dignitaries, who have dragged him thus to their tribunal…” (Life of Christ, p. 76, 1863). F. W. Farrar (1831-1903): “And so, through the thronged narrow streets, amid jeering, raging multitudes, the weary sufferer was dragged once more” (Life of Christ, p. 426, 1874). Ingraham J. H (1809-1860): “Caiaphas, at length came where Jesus had been dragged…” (The Prince of the house of David, p. 356, 1855). “…our Messias,… was dragged, a prisoner, through the streets…” (Ibid., p. 336). “These base fellows seized Jesus, and, aided by the men-at-arms, dragged him forth into the outer or common hall” (Ibid., p. 388). “By this time the people who were dragging Jesus to death, were got out of the gate…” (Ibid., p. 390, 1855). Ellen White (1827-1915): “At the suggestion of Herod, a crown was now plaited from a vine bearing sharp thorns, and this was placed upon the sacred brow of Jesus; and an old tattered purple robe, once the garment of a king, was placed upon his noble form” (3SP, p. 138, 1887). Wesley (1703-1791): “They put on him a scarlet robe – Such as kings and generals wore; probably an old tattered one” (Wesley’s Explanatory Notes, Matthew 27, 1755). Joseph Benson (1749–1821): “Here they added the shame of disgrace to the bitterness of his punishment; for, sore as he was, by reason of the stripes they had laid on him, they dressed him as a fool in an old purple robe” (Joseph Benson’s Commentary of the Old and New Testaments, Matthew 27, 1818). Albert Barnes (1798-1870): “As we cannot suppose that Pilate would array him in a new and splendid robe, we must suppose that this was one which had been worn and cast off as useless, and was now used to array the Son of God” (Barnes’ Notes on the Whole Bible, 1834). Ellen White (1827-1915): “He staggered on for few steps, bearing the heavy load, then fell as one lifeless to the ground. He was first pronounced to be dead, but finally revived” (3SP, p. 150, 1878). Ingraham J. H (1809-1860): “Jesus had, at length, sunk to the ground, under the weight of the wooden beams on which he was to die, and fainted. “He is dead!” was the cry of those about him; but, as we drew near, he was reviving,…” (The Prince of the House of David, p. 391, 1855). Ellen White (1827-1915): “The mother of Jesus was there. Her heart was broken with anguish, such as none but a fond mother can feel. Her stricken heart still hoped, with the disciples, that her son would work some mighty miracle, and deliver Himself from his murderers” (1SG, p. 58, 1858). Ingraham J. H (1809-1860): “His noble and heart-broken mother, whom with difficulty we could restrain…Mary, Martha, and Lazarus, were also with us, …besides, there were with us four or five of the disciples, …and were anxiously waiting the result, and firmly believing that Jesus would yet free Himself by His divine and miraculous power” (the Prince of the House of David, p. 373, 1855). Ingraham J. H (1809-1860): “…close to the cross, while we stood afar off, with his weeping mother, …there we waited in expectation of seeing Him do some mighty miracle from the cross, and descend unharmed,…” (Ibid., p. 402). Ellen White (1827-1915): “They expected that he would manifest his divine power, and deliver himself from the hands of his enemies… Their hopes would rise and fall as the different scenes transpired. Sometimes they doubted, and feared they had been deceived… They called to mind the exciting scenes which they had witnessed, the miracles they had seen Jesus do in healing the sick, opening the eyes of the blind, unstopping the deaf ears, rebuking and casting out devils, raising the dead to life, and even rebuking the wind, and it obeyed him. They could not believe that he would die… The disciples hoped that Jesus would manifest his power, and convince all that he was the King of Israel” 1SG, pp. 51, 52, 1858). Ingraham J. H (1809-1860): “At one moment we are tempted to lose our confidence in Him, and believe, as many now begin to say, that we have been following a deceiver, and in the next to trust fully in Him, and that He will yet overcome His enemies, and be restored to us’ (The Prince of the House of David, p. 322, 1855). Ingraham J. H (1809-1860): “He cannot die! He is a mighty Prophet, and has power that will strike His enemies dead” (The Prince of the House of David, p. 336, 1855). Ingraham J. H (1809-1860): “Master can never be injured by them; and that he will, ere many hours, deliver himself from his foes, and proclaim himself king of Israel” (The Prince of the House of David, p. 383, 1855). Ingraham J. H (1809-1860): “Until that moment [when His side was pierced] he had believed that Jesus would revive, and descend from the cross; for to the last all our faith in His power to save Himself was firm, though greatly tried when we saw Him in the hands of the roman soldiers. Even when we beheld Him nailed to the cross we did not give up hope, for we had all seen him raise dead Lazarus , and felt He could free Himself from the cross alive also” (The Prince of the House of David, p. 415, 1855). Ellen White (1827-1915): “They seized one of his followers, a man who had not openly professed faith in Christ, yet believed on him” (1SG, p. 57, 1858). Ellen White: “Simon had heard of Jesus. His sons were believers in the Saviour, but he himself was not a disciple” (DA, p. 742, 1898). Note: In the above two statements you will note how Ellen White contradicted herself – first, in 1858 she said Simon was a believer, and forty years later, she changed her stand and said, Simon was not a believer! Thomas Stephen: “They, therefore seized on Simon of Cyrene… who was probably a disciple, and compelled him to bear it” (A Gospel History of our Lord and Saviour Jesus Christ: or, a Life of the Man of Sorrows, p. 709, 1853). Ingraham J. H (1809-1860): “Simon of Cyrene, a venerable man, well – known to all in Jerusalem, and father of two young men, Rufus and Alexander, who were followers of Jesus, having sold, the last year, all they had in order to become his disciples…” (The Prince of the House of David, p. 392, 1855). Henry Ware (1794-1843): “… the soldiers seized upon Simon, a Cyrenian, who is commonly thought to have been one of the disciples, and compelled him to carry his Master’s burden” (The Life of Our Saviour, p. 258, 1833). The Life of Jesus, written for the Massachusetts Sabbath School Society: “Meeting in the way a man named Simon, who was from Cyrene, a province of Africa, – probably a follower of Jesus, – they compelled him to bear the cross to the place of death” (The Life of Christ, p. 186, 1854 ). Ellen White (1827-1915): “The mother of Jesus was agonized, almost beyond endurance, and as they stretched Jesus upon the cross, and were about to fasten his hands with the cruel nails to the wooden arms, the disciples bore the mother of Jesus from the scene, that she might not hear the crashing of the nails, as they were driven through the bone and muscle of his tender hands and feet” (1SG, p. 58, 1858). Ingraham J. H (1809-1860): “His mother, supported by John, could no longer gaze upon her son, and was borne afar off, crying thrillingly: “Oh let me not hear the crashing of the nails into His feet and hands! My son – my son!” ” (The Prince of the House of David, p. 399, 1855). Ellen White (1827-1915): “The thieves were taken by force, and after much resistance on their part, their arms were thrust back and nailed to their crosses.” (1SG, p. 59, 1858). Ellen White: “The two thieves wrestled in the hands of those who placed them on the cross; but Jesus made no resistance” (DA, p. 744). Ingraham J. H (1809-1860): “His struggles, for he was an athletic man, were so violent, that it took six persons to keep him held down upon the arms of the cross, and his palms spread open, to receive the entering nail… Ishmerai [the thief] gnashed his teeth as the nail entered the quivering flesh… while a shriek, mingled with curses, bore testimony to the agony suffered by the wretched man” (The Prince of the House of David, p. 394, 1855). Ellen White (1827-1915): “But Jesus meekly submitted. He needed no one to force his arms back upon the cross. While the thieves were cursing their executioners, Jesus in agony prayed for his enemies, Father, forgive them, for they know not what they do” (1SG, p.59, 1858). Ingraham J. H (1809-1860): “He made no resistance when bound upon the cross, but resigned himself passively into their hands of his executioners… “Father,” he said, raising his holy eyes to Heaven, “forgive them,” for they know not what they do.”… Unlike the first robber He did not resist” (The Prince of the House of David, p. 401, 1855). Ellen White (1827-1915): “They raised the cross after they had nailed Jesus to it, and with great force thrust it into the place prepared for it in the ground, tearing the flesh, and causing the most intense suffering” (1SG, p. 59, 1858). Ingraham J. H (1809-1860): “…and when the four men raised Him and the cross together from the earth, and let the end drop into a hole a foot deep, the shock, bringing His whole weight upon the nails in His hands, tore and lacerated them…” (The prince of the House of David, p. 401, 1855). Ellen White (1827-1915): “Nature sympathized with the suffering of its Author…Terror seized the executioners and spectators as they beheld the sun veiled in darkness, and felt the earth shake beneath them” (2T, p. 211, 1871). Ellen White: “The Sun of Righteousness was withdrawing his light from the world, and nature sympathized with her dying Author. A great darkness clothed the earth as with sackcloth of hair, and enshrouded the cross. It was as if the sun in its noonday splendor had been blotted out. Thus was represented the night of woe that was settling down on the Jewish nation. (Advent Review and Sabbath Herald, December 28, 1897). Ellen White: “Amid the awful darkness which is felt even by sympathizing nature,…Nature sympathized with the sufferings of its Author. The heaving earth, the rent rocks, and the terrific darkness, proclaimed that it was the Son of God that died” (Signs of the Times, August 28, 1879). Ingraham J. H (1809-1860): “All things in the air and on the earth sympathise with His death, as if He were the very God of nature who has expired…All nature sympathises with His death! The sun veiled his brightness, the heavens clad themselves in mourning, the gods sent forth angry lightnings, and the earth herself heaved and rocked as if sharing the universal woe!” (The prince of the House of David, pp. 411, 412, 1855). Ellen White (1827-1915): “But notwithstanding the disciples had been disappointed in their hopes concerning Jesus, yet they loved him, and respected and honoured his body…” (1SG, p. 64, 1858). Ingraham J. H (1809-1860): “We bury Him with this deference and respect, centurion,” answered Rabi Joseph,…We do this honour to the memory of one whom to know was to love, even though we are disappointed in seeing Him establish the kingdom in Judah”” (The Prince of the House of David, p. 420, 1855). Ellen White (1827-1915): “The new tomb enclosed Him in its rocky chambers. If one single sin had tainted His character the stone would never have been rolled away from the door of His rocky chamber, and the world with its burden of guilt would have perished” (MR 10, p. 385, 1893). John Ross Mac Duff (1818-1895): “If there had been one flaw in His person or work, or had one single transgression of His people been unatoned for, He still would have been detained victim of death – Death’s iron fetters would still have bound Him; the overlaying stone would still have been fast over the mouth of His grave” (Memories of Olivet, p.344, 1868). Ellen White (1827-1915): “…but their hopes were all crushed… Lonely hours the disciples spent in sorrow, weeping over their disappointment…They expected that he would reign a temporal prince; but their hopes died with Jesus. They doubted in their sorrow and disappointment whether Jesus had not deceived them. His mother was humbled, and even her faith wavered in his being the Messiah” 1SP, pp. 63, 64, 1858). Ingraham J. H (1809-1860): “We believed [Him] to be sent from god to be the saviour of our people, and the prince who should sit on the throne of David to restore the former splendour of our nation – is dead! With him have perished our hopes! … I am the mother of him who deceived Israel… She is humiliated in the very ashes of shame… he has in his death so sorely crushed all our hopes…” (The Prince of the House of David, pp. 328, 333, 341, 1855). Ellen White (1827-1915): “His wounds became the trophies of his victory in behalf of the race” (RH, July 18, 1882). Charles H. Spurgeon (1834-1892): “I can conceive, first, that the wounds of Christ in heaven will be a theme of eternal wonder to the angels… Nor are these only the ornaments of Christ: they are his trophies—the trophies of his love” (The Wounds of Jesus, Delivered on Sabbath Evening, January 30th, 1859). Ellen White (1827-1915): “One reminder alone remains: Our Redeemer will ever bear the marks of His crucifixion. Upon His wounded head, upon His side, His hands and feet, are the only traces of the cruel work that sin has wrought… And the tokens of His humiliation are His highest honor; through the eternal ages the wounds of Calvary will show forth His praise and declare His power” (GC, p. 674). Bennett James (1774-1862): “He rose with these marks; and did he not ascend with them? And will he not forever bear them? John saw him, as a lamb that was slain. And will it not be to him eternal honour and to our eternal joy? It is not impossible that the martyrs may bear, in their risen glorified bodies, the marks of the death they endured for the lord Jesus. But, the king of martyrs should bear, forever, the scars of the atoning death he suffered for us, seems calculated to raise higher the song” (Lectures on The History of Jesus Christ, p. 536, 1828). John Ross Mac Duff (1818-1895): “… in the form of a Lamb, bearing scars and blood-marks… Not only it is Christ ascended, Christ glorified, but Christ wearing the old badges of humiliation and suffering – still red in His apparel” (Memories of Olivet, p. 338, 1868). Ellen White (1827-1915): “The mystery of the cross explains all other mysteries. In the light that streams from Calvary, the attributes of God which had filled us with fear and awe appear beautiful and attractive” (4SP, p. 469, 1884). Daniel March (1816-1909): “This great mystery of the cross explains all other mysteries, and is itself dark to our vision only from excess of light” (Walks and Homes of Jesus, p.326, 1866).